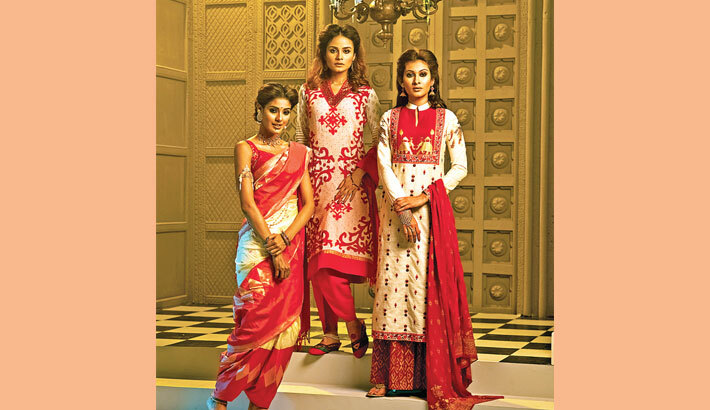 Aarong, one of the most renowned fashion houses of the country, has launched its Puja collections which are available at all Aarong outlets and aarong.com. The theme of this year's collection has evolved from traditional mud art commonly visible in tribal zones of Bangladesh. Vibrant designs in various colour palates have been portrayed on salwar kameez, punjabi, dhuti, coty, ladies kurta, sari and kids attires. Archetypal katan and floral embroidered jamdani saris are in demand while punjabi and dhuti sets for men are major attractions of their collections. Their salwar kameez line has blended alpona and ornamental motifs in several fabric choices such as natural endi, cotton, silk and muslin. The much anticipated ladies kurtas are also available in velvet fabric with hand embroidery as well as shibori dye for an ethnic touch.